Sienna Miller, who is credited for creating the boho fashion trend in the early Noughties, seems to have gone back to her carefree roots. The beautiful, sweeping hairstyle is youthful, edgy and seemingly low-maintenance. The 33-year-old actress has spawned a host of copycat hairstyles with her chic new bob hairstyle, but the look essentially came about thanks to a film role. Sienna was feeling very liberated by chopping her hair off. 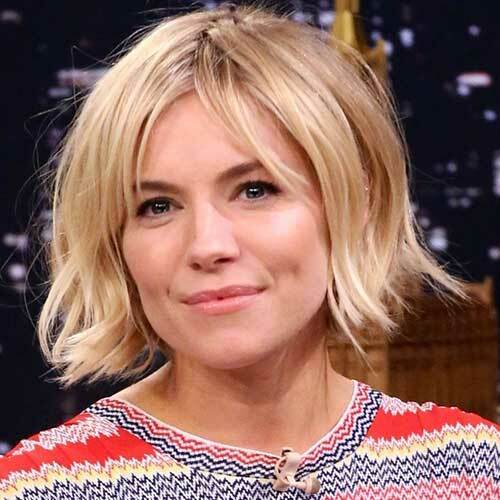 Here are 15 Sienna Miller Bob Hairstyles. Check out these blonde British beauty’s celeb bob hairstyles!